Scans traffic on all ports. 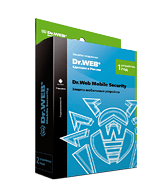 Checks URLs on Doctor Web's server regardless of the update settings or how up to date a computer’s Dr.Web virus databases are (more). Blocks websites that fall into any of 12 thematic groups (adult content, violence, weapons, drugs, gambling, etc.). Protects children from exposure to objectionable content. Block any attempts to adjust the system time and time zone to prevent children from using the computer without their parents’ permission. The "Interval Time Limit" option lets parents specify the amount of time (in 30-minute intervals) that their children can spend on the computer. Automatically block night-time access to a PC. Blocks access to individual files and directories to keep your files and important information protected from deletion and unauthorised access. The access mode parameter (deny access or grant access in the read-only mode) offers more ways to configure access. Parental Control settings profiles can be established individually for each user. Settings can be imported between user accounts. The Parental Control can be disabled for a particular user account. Wie fragil die Kinderwelt im digitalen Zeitalter ist und warum es Elternschutz braucht, erfahren Sie in den folgenden Ausgaben des Aufklärungsprojektes «Die komplette Wahrheit über Viren & Co.».